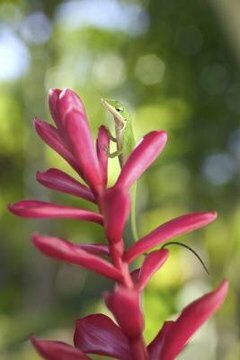 Geckos are a type of small, omnivorous lizard. There are approximately 1,500 species of geckos on the planet, though only a handful of these are common as pets. A strong diet for a gecko will include a careful balance of protein and vegetable sources. Another important aspect in a gecko's diet is making sure that they get enough calcium, which can be provided by feeding fruits in moderation. Certain fruits are great for geckos, while others can be detrimental to their health. Fruits with a high calcium and low phosphorus content are best, such as apples, peaches, cantaloupe, papayas, mangoes, peaches, nectarines and apricots. Starfruit, rhubarb and avocado must be avoided, as they contain compounds that are dangerous or toxic to reptiles. Can Bearded Dragons Eat Bell Peppers? What Type of Greens Do Mice Eat?